I had a Sous Vide Supreme water bath, and two strip steaks I purchased from my meat CSA, so it was time to get all science-like and try a new cooking technique. Could I produce a steak that was cooked to the same doneness all the way to the edges that still had a brown exterior crust? Lets find out. I began with two strip steak that were about an inch thick. I let them come to room temperature. 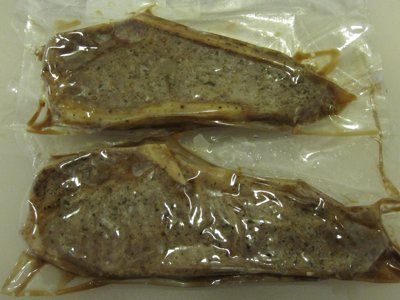 I seasoned them with salt and pepper, then sealed them in individual vacuum bags. The nozzle on the vacuum pump sits over the blue ring on the bag. 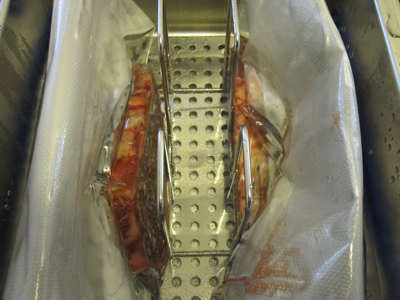 I pre-heated the water bath to 135 °F — the temperature for medium-rare beef — and added the bags. I removed the steaks after 45 minutes, and let them rest for an additional ten minutes. Notice the dull, brown, unappetizing color. I prepared some side dishes while the steaks rested, including Lyonaise potatoes sauteed in pork fat. When the potatoes were done, I removed them to a warm bowl, heated the remaining fat at medium-high, and quickly seared the steaks for a minute per side. Have a look at the cross-section: perfectly pink meat all the way to the edges (that’s fat on either side). 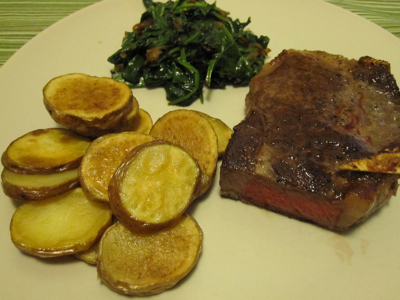 I plated the steak with the potatoes and some wilted sopinach with caramelized shallots. 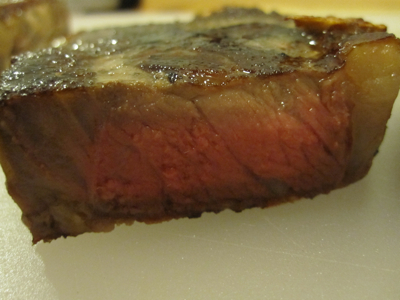 The steak was definitely cooked: it was soft and easy to slice, had a god chew, with the fat just softened enough. I can’t think of any reason why I shouldn’t cook steaks like this all the time. How water from my tap is already at 131 °F, so it takes no time at all for the water bath to come up to temperature. The 45 minutes of cooking time is enough to prepare accompaniments. Steak dinner in less than an hour — you can’t beat it. I’m already thinking ahead: cook and hold the steaks, light a charcoal grill, and finish with a quick char before serving. No more variably-cooked meat for me! More about Lyonaise potatoes sauteed in pork fat, please! By the way, “&emdash;” is soooo 1996. Fixed the emdash typo. Believe it or not, until a month ago, I always typed “—”, so I’m still learning the more logical shortcut. For the potatoes, slice unpeeled fingerling potatoes into quarter-inch-thick discs. Put them in a pot, cover with cold water, add a generous amount of salt, two bay leaves, and three unpeeled but smashed cloves of garlic. Bring to a boil, reduce to a simmer, and cook for ten minutes. Drain and dry the potatoes on paper towels, then sauté in the hot fat of your choice (I’ve used pork and duck, but bacon would work) over medium-high heat until browned on both sides. So, please tell me your thoughts, as many as you care to share, about your $500 perfect steak cooker. I have worked several restaurants with SV, and am quite interested in one for myself, but know that for double the price I can get an immersion circulator. But do I even really need anything for my purpose? Thanks! To begin with, the Sous Vide Supreme is $450 at Amazon. I only spent $200 to purchase it, making up the balance with gift certificates I had been hoarding against the SVS’s eventual availability online. I used to work in biotech, and thought long and hard about an immersion circulator, but decided against it because it was pricey and bulky. For a while I used a “ghetto sous vide” rig, but got tired of tweaking and tending a huge pot of water on my stove. I like the idea of having a box I can fill with water, set to a temperature, and forget about. If I get serious about doing a lot of sous vide cooking, I may find that the box is too small and will have to give in and by the circulator. I don’t know what “your purpose” is, but there are solutions that are cheaper than my box, but more convenient than tending a pot on the stove. Auber Instruments sells a rig that uses a thermocouple, power regulator, and a high-capacity rice cooker that a lot of people swear by. I guess the major deciding factor is one of volume: will you regularly be cooking a lot of food at once, or large quantities of one type of food? The SVS may not handle the volume you’d like to work with. I’d be happy to discuss this further if you’d like. And thanks for reading; I’ve been following your blog for a while. Iam so craving a good steak and pork potatoes now! 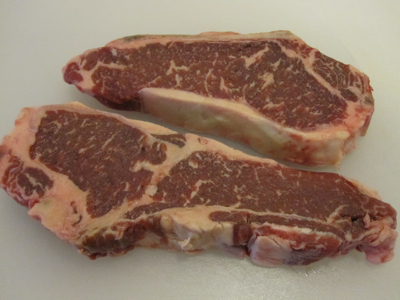 I’ve been cooking SV from steak to 72 hour shortribs (no way ghetto SV would work for that) for a couple years now. I use an IC I got for 70 bucks from ebay. Have you tried searing on very high heat for less time? Say no more than 30 seconds per side.For my taste that works better and seems to preserve more of the “rare” feel and juice. I’m posting about my 48-hour short rib experiment in a day or so. I’m envious that you scored an IC for only $70. What kind is it? 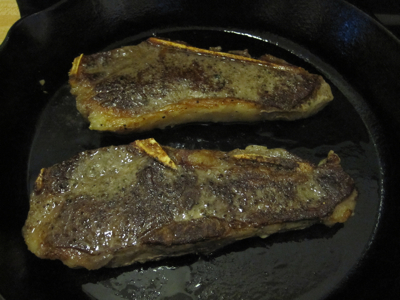 I will probably try a higher-heat sear for less time when I SV a thicker steak. For my first attempt, however, the steaks tasted pretty good. Thanks for reading! I just discovered your blog via Ryan at Nose to Tail at Home. I guess my concern is that I might want more room. I seldom do anything sous-vide, and when I do I tend to settle for the 170˚ setting on my oven. Not much control, I know. I have found some crock-pots that offer a couple more temp settings, but they aren’t adjustable, except one that only goes as low as 165˚. I guess I know that I don’t really need one, or at least that it low on the priorities list. Maybe I was just fishing for a better reason! Keep up the great work! You can always use a big pot on the stove, but it requires more fiddling. If you want more cooking volume and low price, the sous vide rig in this article is the way to go. I am curious about your vacuum pump. It looks like a zipvac. Also, it looks like it works well–is it better than food saver? 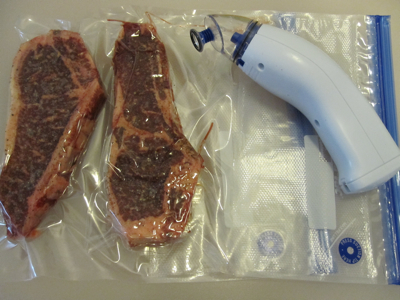 That vacuum sealer was made by Reynolds, but I’m b not sure if it’s still available. Home Shopping Network – where I get the zip-top vacuum bags, probably has a pump. I use the zip bag when I want a gentler vacuum, but I also have a FoodSaver.